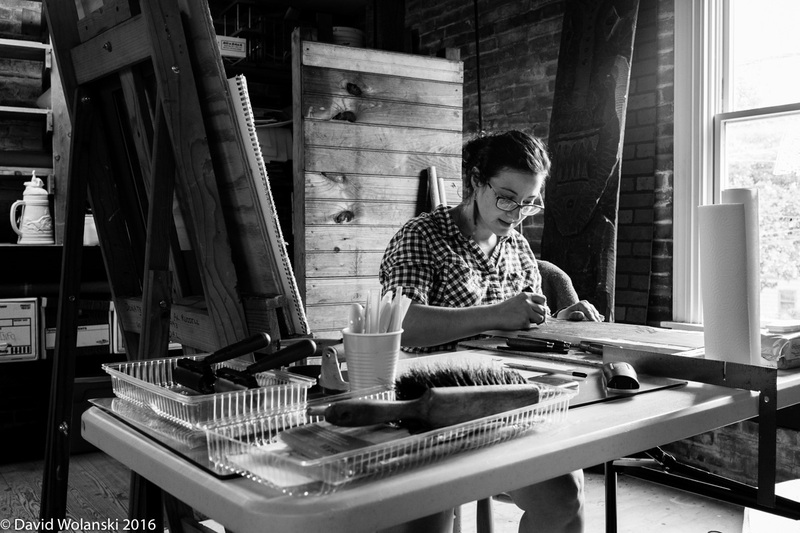 Last week I went to see Laura Mancuso’s studio here in Dover. 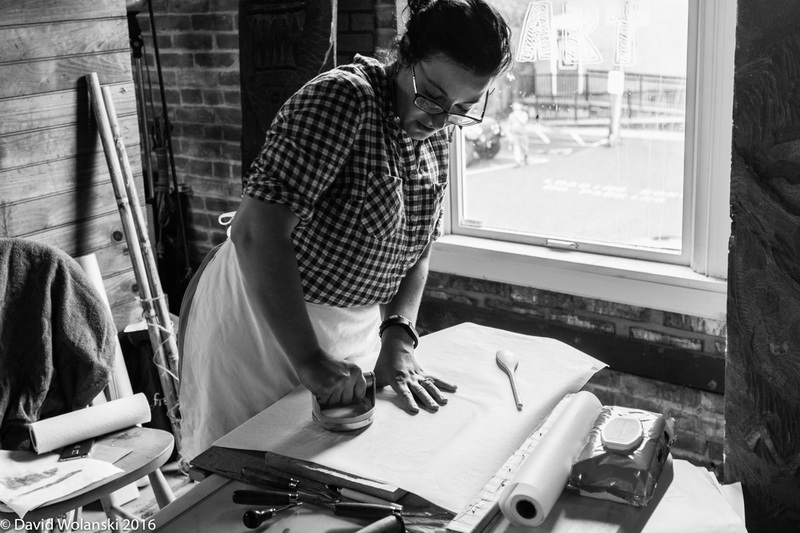 Laura is a print maker and works in a variety of substrates. Wood, cardboard and monotypes are favorites though! I kind of jumped ahead. The first thing you need to know about Laura is how to say her name! It’s pronounced Lowra, where the “ow” sounds like the word you say when you bump your toe. Not the F bomb, the other one! Anyways. Back to the visit. 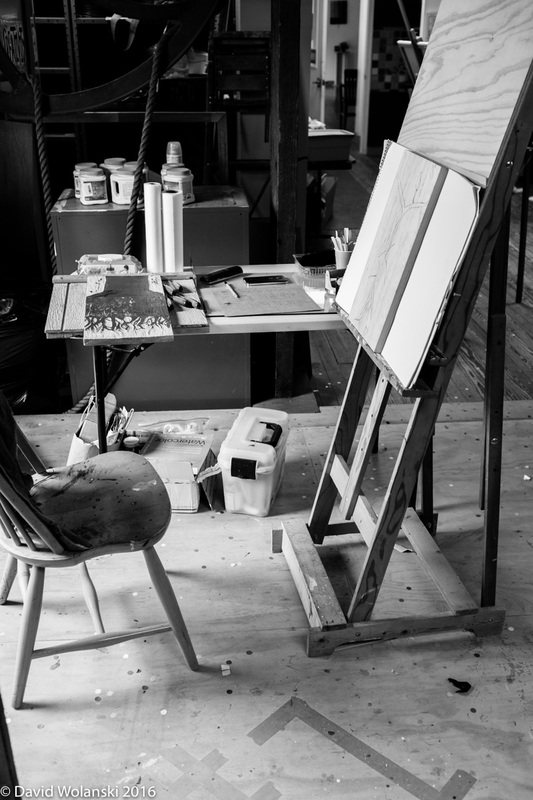 Her studio is just a small space with great lighting, a few tables to work from, and places to hang prints to dry. The tools are simple too. Here are some gouges and chisels to carve the wood. The wood is just some readily available pine from the big box store. Of course it needs to be flat! Laura is working on some architectural roots stuff. This is part of one section. The print is kind of reverse from the carved wood. Laura carving into the wood block. After rolling some ink on the block, Laura makes a test print to show me how the small scratches she made make light or shaded areas on the print..
Hand printing is more physical than I imagined. She bore down pretty hard to get the ink onto the paper! Here’s the print from the block! I was interested in how the paper affected the look of the print. This paper had some kind of water marking on it, that was very organic looking and added to the tree root look. Laura said she could add water color paint or other stuff to the print to complete the look she has in mind. She could also have done different colors by using rollers in tandem. My take away was that Laura has to make a thousand different choices and each one could take the finished print over the top, or just kill it! 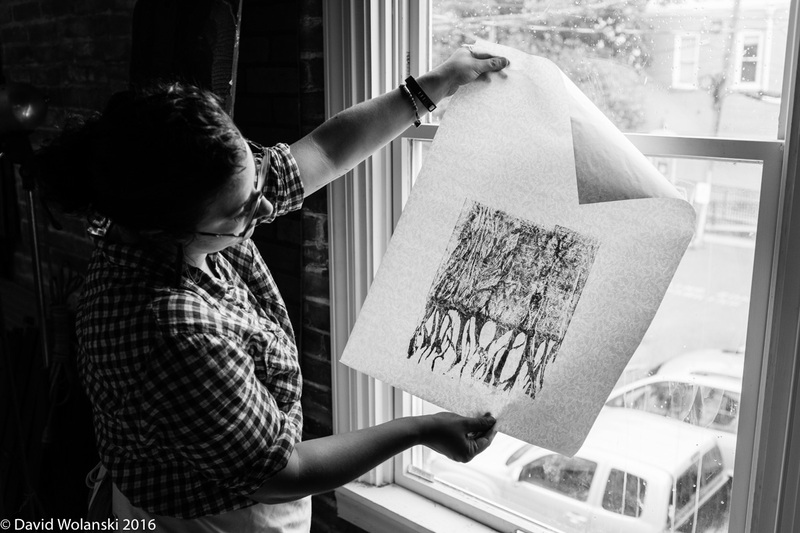 Laura showed me how she makes mono prints too! For those she puts her ink right on a glass plate, or really, anything smooth and not porous, and then draws, scoops or otherwise manipulates the ink. She then gently lays the paper on top and then presses the paper firmly, but not too firmly, into the ink to transfer the print. It’s called a mono print because each print can only be made one time. Any secondary images are different. Laura made one print from this and then I suggested she take out the three big stripes you see kind of on the top right of the ink here. She entertained the idea and added some other colors and came up with the secondary print. I’m thinking I got the name wrong, but, anyways… In the photo below the first print is up top and the second print is in Laura’s left hand. I showed it in color so you can see some of the changes from one print to the next. Two different prints from the monoprinting process I talked about above. There will never be any duplicates! Speaking of hands, cleanliness is next to godliness for printers! If you get some ink on your hand, and don’t know it, when you pick up your fresh print, bad things happen! The cleaning material of choice is baby wipes! For the plates, blocks, and printers hands and tools! 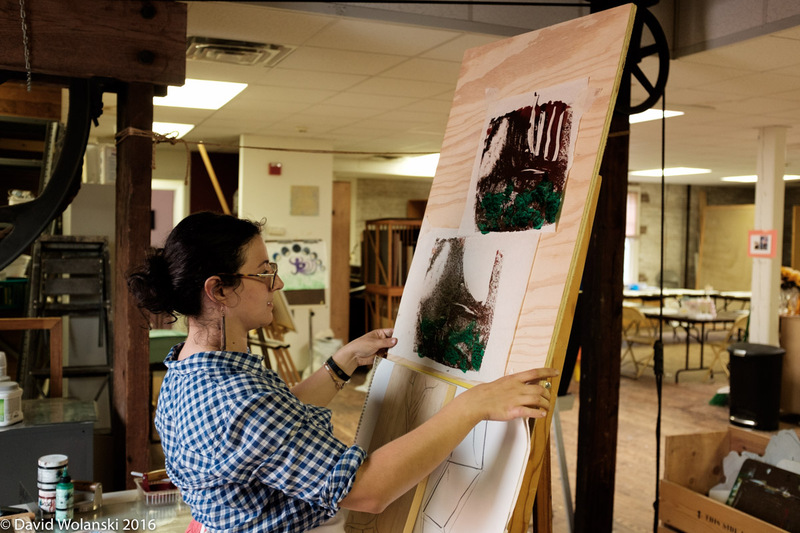 I had a great time talking with Laura about the process and her artistic vision. We talked for over an hour and I’m sure I barely hit the tip of the iceberg. As has become my custom, here are Laura’s answers to the little survey I’ve been asking folks. I am primarily a printmaker. The thing I like most about printmaking is the freedom that it offers as a medium. 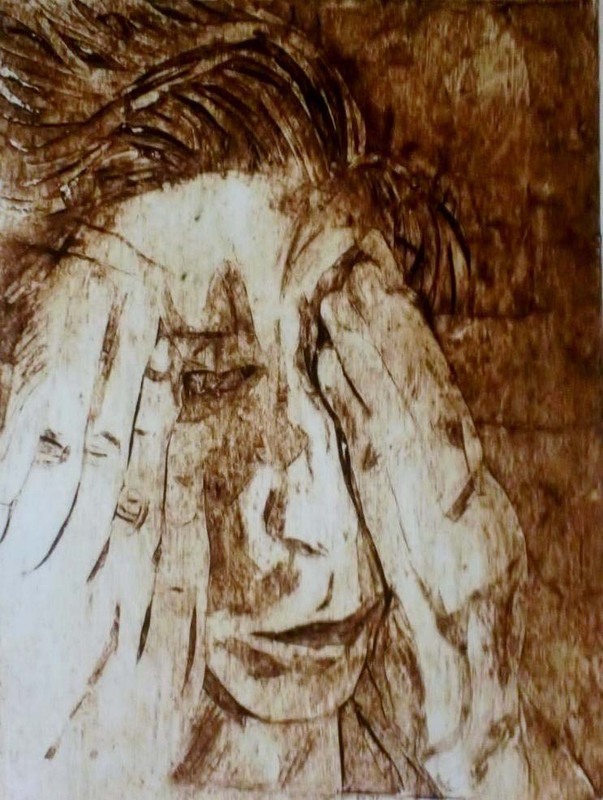 It allows you the ability to create so many kinds of artistic styles within one medium-you can be painterly, sculptural, minimal, textural or expressive just by changing the material you are carving/etching on. I also love how the material can become part of the print- For example, if you are carving into wood the knots and grain add texture and can be incorporated in the composition of the final print. I like all the various techniques but my favorite technique at the moment is called a cardigraph, where using an exacto knife you cut and peel away at seven-layer cardboard plate. 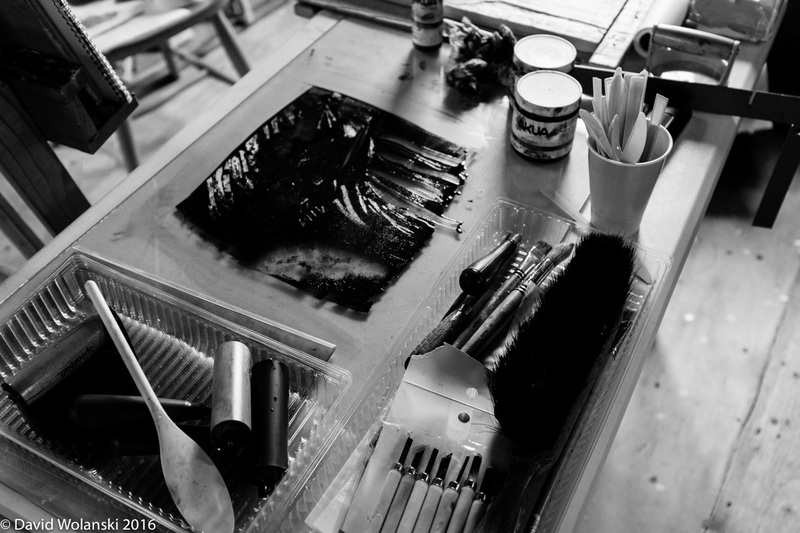 The deeper you cut away at the plate, the darker the tone will be on the final print. Once complete the cardboard plate is sealed and compressed using a printing press. 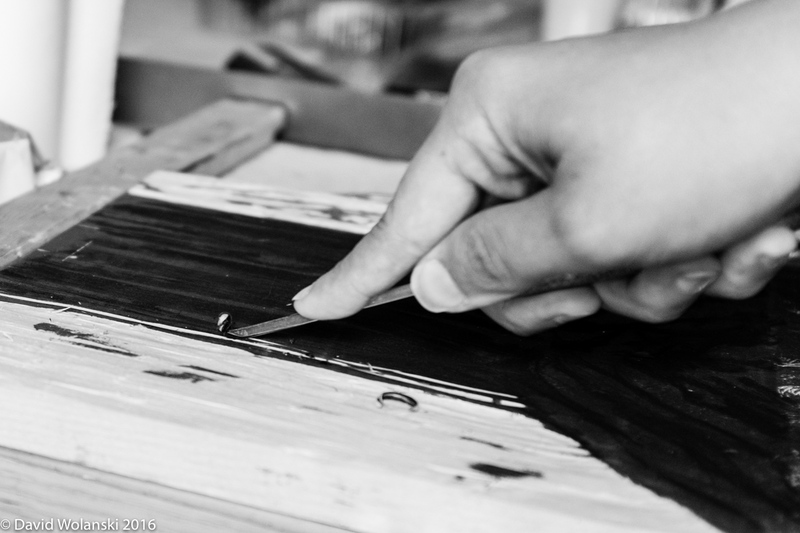 By applying ink on the plate and wiping away the ink, the optimal tones are achieved. 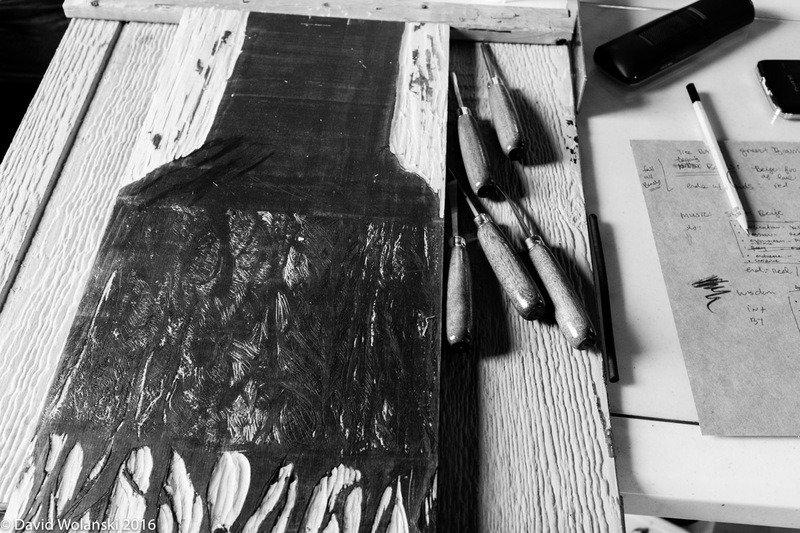 Once the plate is inked, it is placed on damp paper and pulled through a press. I love how in this technique, from an ordinary and non-traditional material, I can create texture as well a range of tone from light to dark. When I am not printmaking, I like to draw using charcoal, ink and watercolor, often combining these materials. Do you have a day job too? 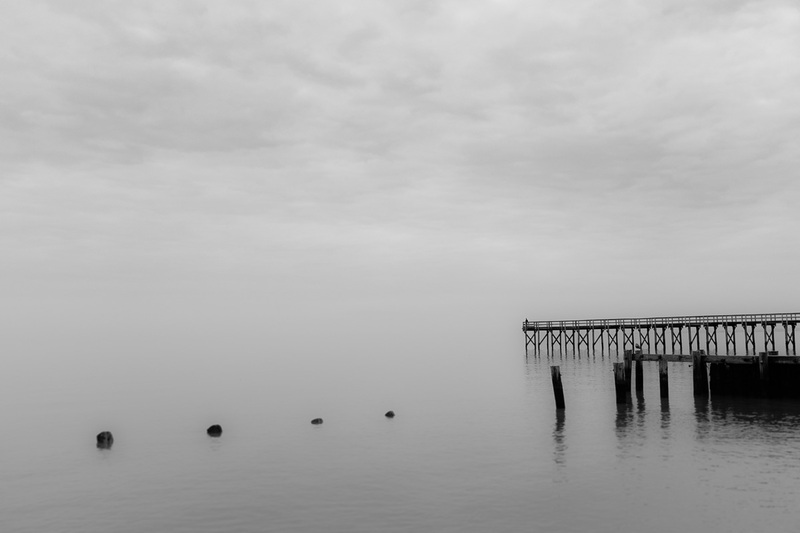 I am the Curator and Manager of the Dover Art League (DAL). I really enjoy working there because I get to work with artists as well as meet art lovers and appreciator of all ages. I love connecting with the community and collaborating with arts organizations and love curating the exhibits. 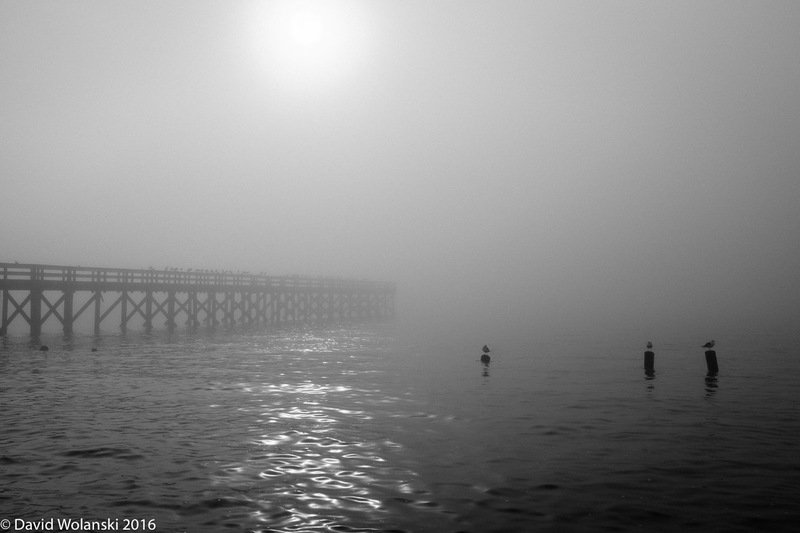 I’m inspired by dreams as well as stories and landscapes that live within a community. I’ve lived in many different places from Central New York, Florence and Pescara, Italy to Anchorage, Alaska and in my artwork I explore the various landscapes and various stories collected while living in all these different places. I try to find the common themes in the collections of stories and use those common themes that link all of humanity. For example, in my last solo show, in Anchorage I explored human resiliency in a series of cardigraph prints. The idea came about after I dreamt about a group of people walking through a woods with all their worries and emotional weight. They approached a beach, applied mud on themselves, washed away the mud then headed back to the woods. 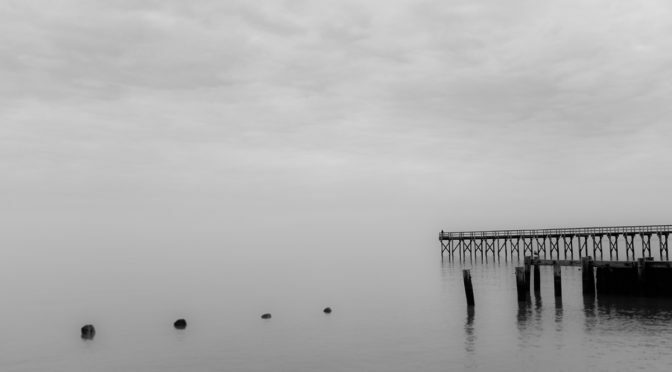 The series included images of emotive portraits, woods and beach landscapes. Postcard from a show Laura did. How long have you been doing it? Any special training? Although I liked art as a kid, I started creating and studying art seriously in high school. In the ninth grade I created my first linocut relief and got the printmaking bug. Shortly after, in 1999, a big Labor Day storm hit in Syracuse, NY. I suffered third degree and second burns on my right shoulder and upper arm when my shirt sleeve accidentally brushed against a lit candle on a table and caught on fire. I was in the burn unit and out of school for the majority of the school year and turned to drawing and writing to express what I could not to others and to heal emotionally after that dramatic event. When I returned to high school and through the remainder of my high school years, I studied the fundamentals and filled my elective classes with art classes, graduating with AP credits and an art scholarship for college. I attended Nazareth College in Rochester, NY and graduated with a B.S. in Studio Art, with a concentration and focus on printmaking and continued showing my work in group and solo shows. I am currently working on my portfolio and planning on applying for and hopefully attending graduate school within the next couple of years. My website it currently being updated and should be up by the end of August. I will keep you updated once it is published. I am also on Facebook at https://www.facebook.com/Lauraantonellaprintmaker. Yes, in January 2017, I will be having an exhibit in The Holden Gallery at the Dover Art League called Roots: Architectural Prints by Laura Antonella Mancuso. 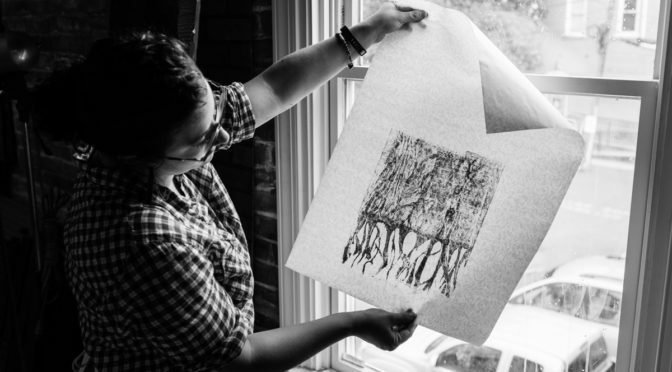 The series will be blending bookmaking with printmaking and drawing and will explore the many meaning of the word ‘roots’ as it relates to people and nature. 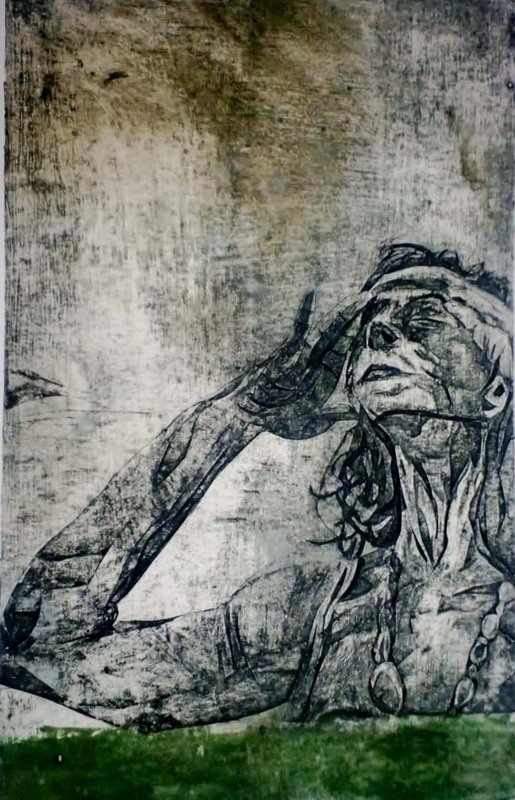 The series will blend printmaking and bookmaking techniques, creating print that have form. They will have an architectural quality being both 2d and 3d. Laura, thanks for letting me into your world and sharing it with others! I can’t wait to see the show in January!